Introduction EMSL Analytical, Inc. is recognizing it's Phoenix Lab for its AIHA Legionella accreditation. EMSL Analytical, Inc. is pleased to announce that its Phoenix laboratory is now certified for Legionella analysis through the American Industrial Hygiene Association (AIHA-LAP, LLC). EMSL Phoenix is in compliance with International Standard ISO/IEC 17025:2005 policies and procedures along with offering high-quality testing services to its clients. 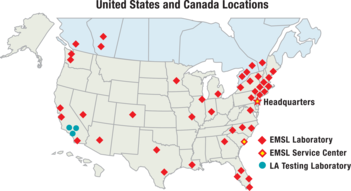 Nationwide, EMSL is the leading Legionella testing laboratory with 20 CDC ELITE certified locations, including Phoenix, throughout the United States and Canada. Along with Legionella testing, EMSL Phoenix offers asbestos and microbiology testing services. The laboratory is certified by the American Industrial Hygiene Association (AIHA) for testing through the Environmental Microbiology Laboratory Accreditation Program (EMLAP). EMSL Phoenix is an AIHA-LAP, LLC Environmental Microbiology Proficiency Analytical Testing (EMPAT) participant for fungi. The Phoenix lab is also certified through the American Association for Laboratory Accreditation for biological food testing. In addition, EMSL Phoenix is accredited by the National Voluntary Laboratory Accreditation Program (NVLAP) for bulk and airborne asbestos analysis. The laboratory is accredited by the California State Environmental Laboratory Accreditation Program and the State of Hawaii Department of Health the for bulk asbestos. EMSL Phoenix is certified for phase contrast microscopy (PCM), polarized light microscopy (PLM) and mold analysis by the Colorado Department of State Health Services.